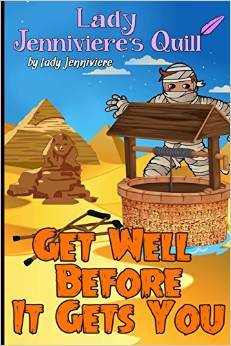 Get Well Before It Gets You is a book by Lady Jenniviere for the pre-teen. It’s listed as a science fiction & fantasy, making it intriguing for both boys and girls. I think it’s important to note from the start that this book is intended to be a little scary, even for the pre-teen. It’s definitely not a thriller or horror book, but might be a little intense for some readers. I would urge parents to read the book first and determine if it might be appropriate for their son or daughter. Aside from the bit of scare involved, it is a very solidly written book with the intent of weaving an interesting fantasy story line with life lessons about family, friendships, and independence versus asking for help. When Eddie falls into an ancient, hidden well, he finds himself immersed into a world of witchcraft and spells. His friend Holly comes to his aid and together they work to unravel the mysteries before it is too late. This book is very well written and brings forth the characters in a way that makes you believe they are truly with you. Eddie and Holly are true friends, sticking together through thick and thin, and able to work together to solve problems. Their relationship is a good example to readers about friendship, persistence, and working together. I’d recommend this book for pre-teens that are able to separate the fear from reality. It does have some points where a younger child (emotionally) might feel intense fear, while an older child will probably laugh through some of the points, realizing it is mere fantasy. I received this book at a reduced price or free in exchange for an honest review. The opinions are entirely my own.